36 Fairfield is located on the east side of Fairfield, between Commonwealth and Newbury, with 34 Fairfield to the north and 38 Fairfield (235 Newbury) to the south. 36 Fairfield was built in 1878-1879 for banker and real estate investor Asa Perkins Potter, one of eight houses, four on each side of the block: 32-34-36-38 Fairfield on the east and 31-33-35-37 Fairfield on the west. He and his wife, Delle (Sheldon) Potter, lived at 29 Fairfield, built at about the same time. 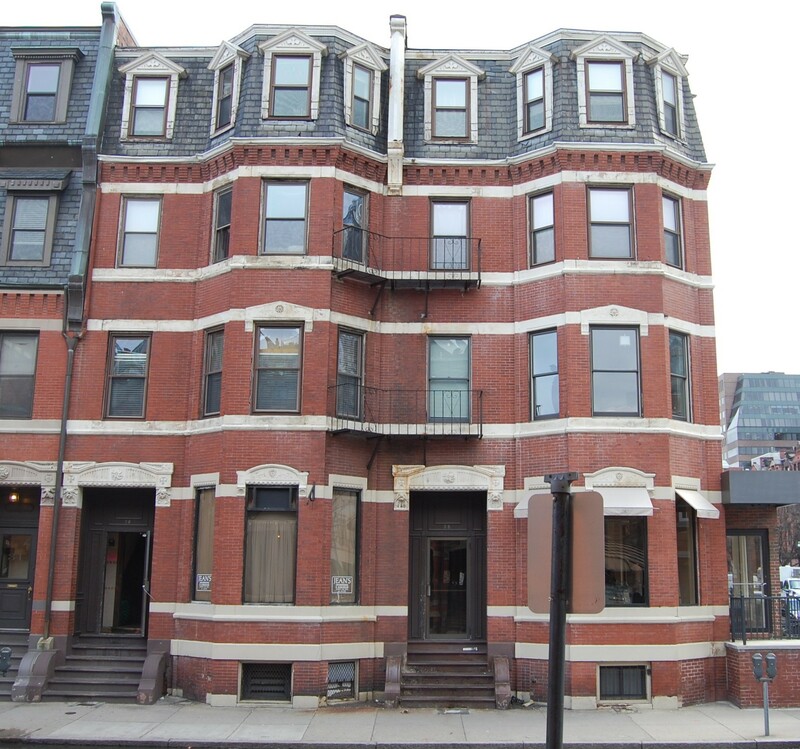 Click here for an index to the deeds for 36 Fairfield. On October 17, 1879, Asa Potter sold 36 Fairfield to Silas Merrill. The deed included an easement reserving a three foot wide strip across the eastern boundary to provide access to the alley for 38 Fairfield. 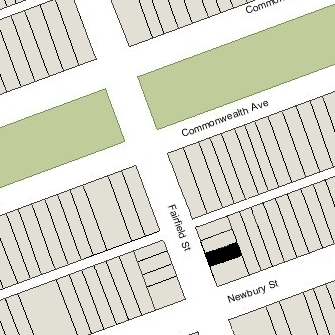 A similar easement was included in the deeds for 32 and 34 Fairfield. On December 4, 1879, Silas Merrill sold the property to real estate dealer Samuel Horatio Whitwell, and on the same day, he conveyed the property to Charles S. Miller. 36 Fairfield became the home of Charles Miller and his parents, Edward Franklin Miller, Jr., and Frances Chapin (Starkweather) Miller. They previously had lived at 526 Columbus. Edward Miller and Charles Miller were wool merchants. On March 25, 1880, Charles Miller transferred the property to his mother. In October of 1881, Charles Miller married Jennie M. Snow. They lived at 36 Fairfield with his parents. They all continued to live at 36 Fairfield during the 1884-1885 winter season. By 1886, Charles and Jennie Miller had moved to Winchester (and by 1888 to Brookline) and Edward and Frances Miller had moved to 171 Falmouth. Frances Miller continued to own 36 Fairfield and lease it to others. During the 1885-1886 winter season, 36 Fairfield was the home of Anstiss Derby (Rogers) Wetmore, the widow of William Shepard Wetmore of New York City and Newport, who had been a merchant in the China trade. She previously had lived at 277 Clarendon. By the 1886-1887 season, she was living at the Tremont House hotel at 37 Tremont. During the 1886-1887 winter season, 36 Fairfield was the home of Arthur Donner. He had lived at 363 Beacon in 1885. He was a banker, consul for Austria-Hungary, and vice consul for Argentina. He later would become treasurer of the American Sugar Refining Company and a key figure in the sugar trust, which controlled over 90 percent of the manufacture and sale of sugar in the United States. By the 1887-1888 season, he was living at 74 Chestnut. By the 1887-1888 winter season, 36 Fairfield was the home of Lucretia Watson (Lunt) Revere, the widow of Paul Joseph Revere, a Brigadier General in the Civil War, killed at Gettysburg. She continued to live there during the 1888-1889 season, but moved thereafter to 350 Marlborough. By the 1889-1890 winter season, Edward and Frances Miller were living at 36 Fairfield again. They continued to live there during the 1892-1893 season, but then were living elsewhere for the next four seasons. During the 1894-1895, 36 Fairfield was the Boston home of retired cotton buyer and dry goods merchant George Wellman Wright and his wife, Georgianna (Buckham) Wright. Their primary residence was at Pine Hill in Duxbury. During the 1895-1896 winter season, 36 Fairfield was the home of Frederic Guild and his wife, Sarah (Woodward) Guild. 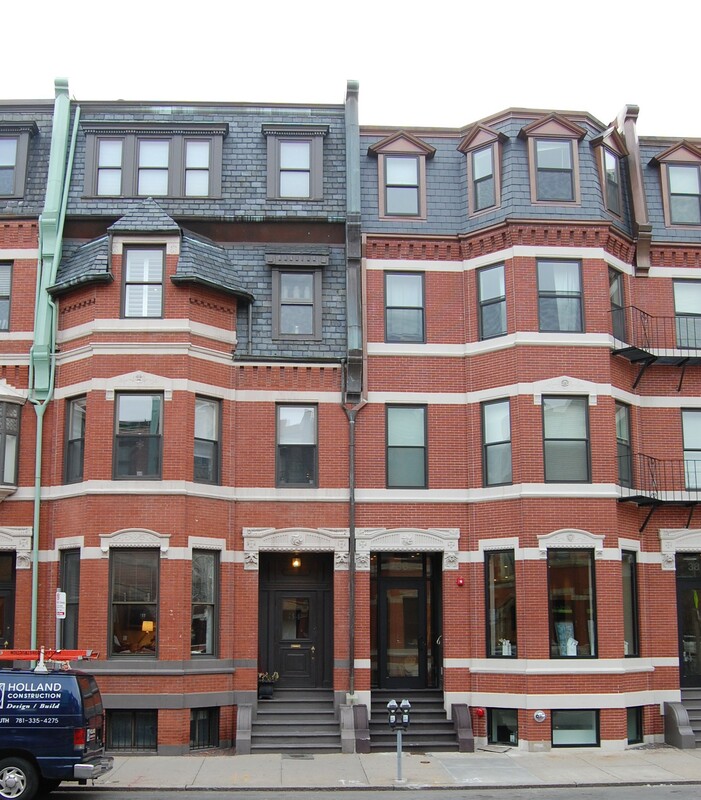 By the 1896-1897 season, they were living at 226 Newbury. 36 Fairfield was not listed in the 1897 Blue Book. The Millers resumed living at 36 Fairfield during the 1897-1898 winter season and continued to live there during the 1898-1899 season. During the 1899-1900 winter season, 36 Fairfield was the home of Allen Arnold, a stock and note broker. His usual residence was in Swampscott. During the 1900-1901 winter season, 36 Fairfield was the home of former bank president Warren Sawyer and his daughter, Mary C. Sawyer. Their primary residence was in Wellesley Hills. Warren Sawyer’s wife, Ellen (White) Sawyer, had died in September of 1900. They had lived briefly at 34 Fairfield in the mid-1890s. During the 1901-1902 winter season, 36 Fairfield was the home of Louis Joseph Sands and his wife, Ella Louise (Faye) Sands. They previously had lived at the Hotel Kempton at 237 Berkeley. Louis Joseph Sands was a retired Naval officer, who had served in the US Navy during the Civil War. By the 1902-1903 winter season, the Sands had moved next door, to 34 Fairfield, and 36 Fairfield was again the home of Edward and Frances Miller. They continued to live there until his death in April of 1903. On February 10, 1903, shortly before Edward Miller’s death, 36 Fairfield was acquired from Frances Miller by grain dealer Charles P. Washburn. By the 1903-1904 winter season, he and his wife, Abbie C. (Parker) Washburn, had made it their home. They previously had lived at 132 St. Botolph. Charles Washburn died in November of 1917 and Abbie Washburn moved soon thereafter. By 1920, she was living in Brookline with their son, Charles P. Washburn, Jr.
36 Fairfield was not listed in the 1919 and 1920 Blue Books. By 1920, 36 Fairfield was the home of Henry Walter Smith and his wife, Bertha Mary (Pope) Smith. He was captain of a tow boat. They operated 36 Fairfield as a lodging house. 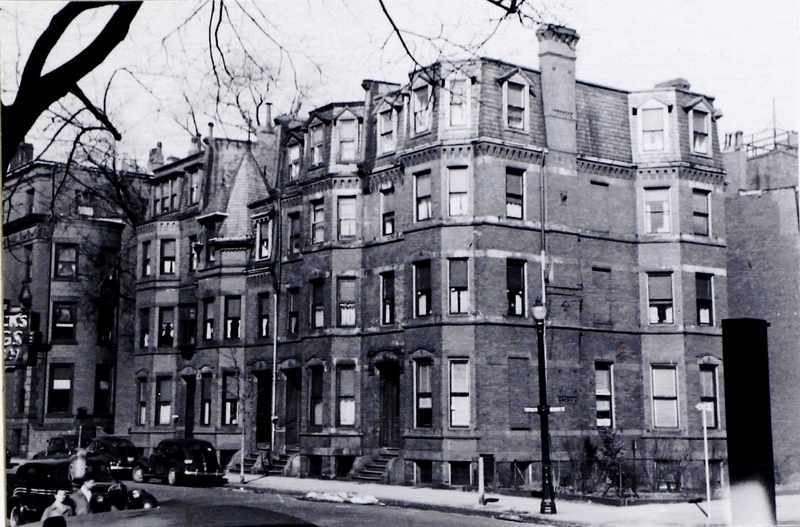 They continued to live there in 1922, but moved thereafter to Brookline. By the late 1920s, they lived in Miami. During the 1922-1923 winter season, 36 Fairfield was the home of Reuben Yates, a jeweler, and his wife, Emily Yates, who operated it as a lodging house. They previously had lived in Somerville. By 1924, they had moved to 225 Newbury, where he had become a cigar dealer. On August 23, 1923, 36 Fairfield was purchased from Charles Washburn’s heirs by Edgar Nathan Carver. He and his wife, Florrie (Reynolds) Carver, made it their home. They previously had lived at 276 Newbury. Edgar Carver had been a newspaper editor and publisher in Maine, where he also served as auditor of state printing. He later operated the New England Linotype School in Boston. By 1920, he was a foreman at a newspaper. On September 2, 1924, he transferred 36 Fairfield into his and his wife’s names. They continued to live there in 1925, but moved thereafter to 206 Commonwealth. On December 15, 1925, 36 Fairfield was acquired from Edgar Carver by Paul Mascarene Hamlen, trustee under the will of William Powell Perkins, his mother’s uncle (Paul M. Hamlen’s parents were Nathaniel Perez Hamlen and Gertrude (Loring) Hamlen; Gertrude Loring’s parents were Francis Caleb Loring and Miriam Mason (Perkins) Loring, William Powell Perkins’s sister). Paul Hamlen already owned 38 Fairfield, and in October of 1927, he purchased 32–34 Fairfield, also as trustee under William Powell Perkins’s will. Paul M. Hamlen was a real estate dealer and purchased the property on Fairfield as an investment for the benefit of himself and his siblings. He and his wife, Agnes Dorothy (Devens) Hamlen, lived at 32 Gloucester and also maintained a home in Wayland. By 1930, 36 Fairfield was the home of Henry R. Church, who probably operated it as a lodging house. He continued to live there until his death in August of 1931. By 1932, 36 Fairfield was the home of Charles Granville Ellis, a vacuum cleaner salesman, and his wife, Gladys Vera (McConnell) Houston Ellis. They operated it as a lodging house. They previously had lived at 8 Yarmouth. The Ellises continued to live at 36 Fairfield until about 1935, but by 1936 had moved to 32 Fairfield, which they operated as a lodging house. They probably also continued to manage the lodging house at 36 Fairfield. They continued to live at 32 Fairfield until about 1945, probably also continuing to operate the lodging houses at both 32 and 36 Fairfield (they are listed at both addresses in the 1938-1944 City Directories). The property continued to be operated as lodging houses. On December 16, 1957, 36 Fairfield was purchased from Stuart Hastings and Joseph Gautreau by Helen (Helene) (Hios) Coste, the widow of Nicholas Coste. In March of 1948, she purchased 38 Fairfield from them. She lived in Jamaica Plan with her son-in-law and daughter, Harry (Aristides) M. Angelus and Despina Tessie (Coste) Angelus. They later all lived in Westwood. 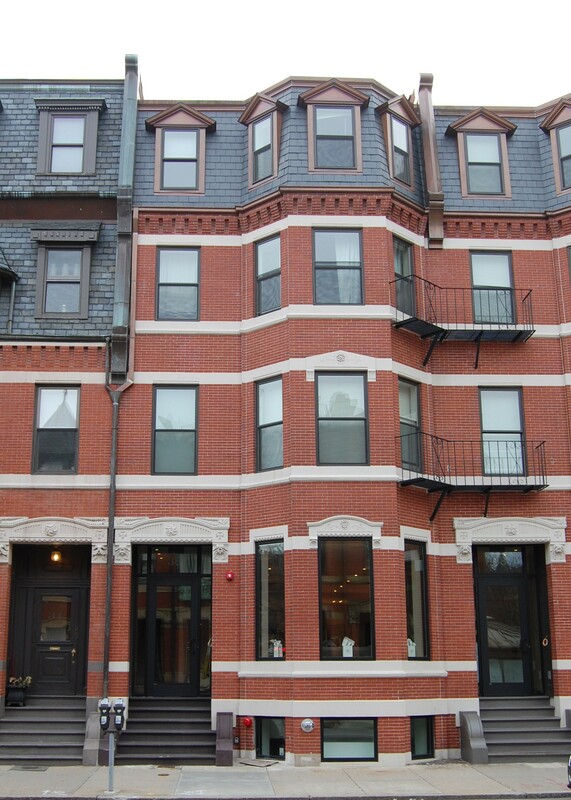 36-38 Fairfield (235 Newbury) remained a combination of a restaurant, retail stores, offices, and apartments in 2016.